Jews settled in Hattiesburg in the early 20th century, and by 1910, a number of Jews from Russia and Eastern Europe had settled in Mississippi’s “Hub City” Where they established Congregation B’nai Israel in 1915. 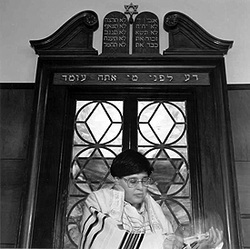 Originally founded as an Orthodox congregation, B’nai Israel switched its affiliation to the Reform movement in the 1930s, and soon after engaged Rabbi Arthur Brodey as its first rabbi. Despite the official switch from Orthodox to Reform affiliation, the congregation remained an alliance between Orthodox and Reform Jews. There were simply not enough Jews in Hattiesburg to support two congregations, so members of B’nai Israel compromised and cooperated in order to meet the needs of all congregants. Up until the 1970s, this often meant holding two separate services. 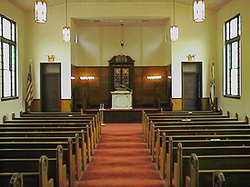 In 1935, the congregation hired their first rabbi, Arthur Brodey Rabbi Brodey was ordained by the Reform movement, and Orthodox members of the congregation still periodically held their services under the lay leadership of Sam Eisman. This Orthodox faction was not, however, marginalized within the congregation. In fact, Eisman served on the congregation’s board for many years. Rabbi Brodey served B’nai Israel until 1942. It took five years for the congregation to find his replacement, Rabbi David Shor, who served until 1950. Rabbi Charles Mantinband arrived in 1951 and served the congregation during much of the Civil Rights era. Mantinband was an outspoken proponent of racial equality and civil rights, arguing that Jews had a responsibility to empathize with the plight of Blacks because of the Jewish community’s own experiences with discrimination. Mantinband was a friend and mentor of Clyde Kennard, an African American from Hattiesburg who unsuccessfully tried to integrate Mississippi Southern University and ended up framed on bogus theft charges. Fearful of violent reprisals, members of B’nai Israel tried to get Mantinband to quiet his voice on civil rights issues. The local White Citizen’s Council threatened B’nai Israel members that they needed to get rid of their outspoken rabbi. 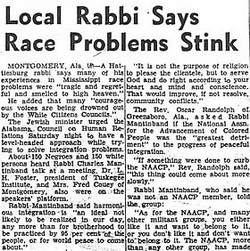 Merchant congregants who had heavy investments in Hattiesburg businesses, were especially concerned that their businesses might suffer from boycotts directed at the Jewish community. Throughout his tenure, Mantinband faced pressure from a congregation that wanted him to stay out of the brewing struggle. Finally, in 1963, Mantinband decided to leave Hattiesburg for a congregation in Longview, Texas. Mantinband’s successor was Rabbi David Ben-Ami, who also was active in support of civil rights. Ben-Ami was a member of the "Committee for Concern," the interfaith committee to raise money for the rebuilding of the burned African-American churches in Mississippi in June of 1964. Ben-Ami was also appointed to the Mississippi State Advisory Committee of the United States Commission on Civil Rights. Ben-Ami was the only Hattiesburg clergyman to visit northern activists in jail. In January 1964, the sheriff reported Ben-Ami’s actions to the congregation. During this time, he became close friends with Rev. Robert Beach of the Federal Council of Churches, who bought a house in Hattiesburg hoping to build some bridges between black and white citizens. Ben-Ami was the only white clergy member that had anything to do with him, and Mr. Beach was refused entry into the local Presbyterian Church, opting to worship at the local black Baptist church instead. When word got round about his efforts at delivering free Christmas turkeys to poor African-American households, they asked him to resign. They did so in a “polite and sympathetic manner,” according to Drew Pearson, a syndicated columnist, who publicized Ben-Ami’s story on December 25, 1964. The story entitled, “There was no Room for him the Synagogue,” brought national attention to his case. By February 1965, Ben-Ami and his family moved to Washington, D. C., where he served as a consultant to the Department of Health, Education and Welfare (HEW). Starting in the late 1970s, the congregation occasionally relied on student Rabbis. Norman Lipson served as a student Rabbi from 1971-1972. They congregation liked him so much that they were able to raise enough money to hire him as a full-time Rabbi from 1974-1977. Following his tenure, the congregation alternated between a series of full-time and student rabbis. Full time rabbis during this time included: Samuel Rothberg, full-time (1977-1980); David Ostrich, full-time (1982-1984); Cyril Stanway, full-time (1987-1990); Judith Bluestein, full-time (1990-1994); Reena Judd, full-time (1994-1997; Celso Cukierkorn, full-time (2000-2007); and Uri Barnea, full-time (2007-2014). In 1969, B’nai Israel was divided over the issue of whether or not to accept a female student rabbi when Sally Priesand was appointed to serve the congregation. The Orthodox faction strongly opposed allowing a woman to serve in this role, and the votes on this issue were so confusing that the final tally was conducted by having congregants stand on opposite sides of a room. 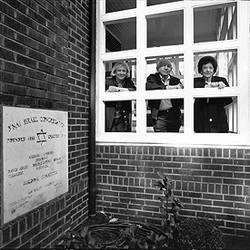 Eventually, B’nai Israel accepted Priesand, who later made history as the first female rabbi ordained in the United States. Twenty years later, B’nai Israel became the first Mississippi synagogue to hire a female full-time rabbi when Judith Bluestein led the congregation. Although all of its full-time rabbis were Reform, B’nai Israel continued to accommodate its Orthodox members. On Friday nights, Orthodox men held a separate service, and the Orthodox congregants often brought in an Orthodox rabbi to lead their High Holiday services. B’nai Israel helped to pay for this visiting rabbi even though they already had a full-time rabbi at the time. The Orthodox services were discontinued in the 1970s when there were no longer enough Orthodox members to make a minyan. The earliest founders of Congregation B’nai Israel were mostly merchant families, but today a large portion of congregations are medical practitioners or faculty and staff at the University of Southern Mississippi. The congregation also serves as host to any Jewish soldiers who pass through nearby Camp Shelby. The last full-time congregational rabbi was Rabbi Uri Barnea, who served from 2007-2014. With his retirement, Congregation B’nai Israel services are led by HUC students, and Student Rabbi Simon Stratford has been appointed to lead for the 2014-2015 year and to teach the 10-15 students in the religious school. While the congregation is not growing, it seems relatively stable. Congregation B’nai Israel in Hattiesburg will likely continue to be the center of Jewish life in southeast Mississippi for years to come. Ben-Ami (Rabbi David Z.) Papers. McCain library and Archives. Hattiesburg, Mississippi. University of Southern Mississippi. Pearson, Drew. “There was no room for him in the synagogue. The Salina Journal Dec. 25, 1964.